Baked bananas with cream cheese is a rich pudding from Martinique which is served on special occasions. 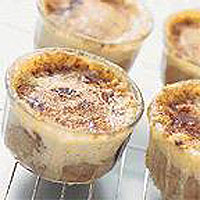 Cook the pudding in an ovenproof dish or in separate ramekin dishes. This pudding is made with Fairtrade bananas. The Fairtrade Mark means that our Waitrose supplier has met international fair trade standards for providing a better deal for the growers in developing countries. Preheat the oven to 180°C, gas mark 4. Cream the cheese, sugar and half the cinnamon together in a mixing bowl using a wooden spoon. Melt the butter over a low heat in the frying pan. Either slice the peeled bananas lengthways for the ovenproof dish or slice them thinly for individual ramekins. Add the cut bananas to the melted butter and fry gently until golden brown on both sides. Distribute the browned bananas evenly, either in a large shallow ovenproof dish or ramekins. Spread the cream cheese mixture over the bananas. Drizzle the double cream over the top and sprinkle with the remaining cinnamon. Place the banana dish in the oven and bake for 15-20 minutes until the cheese is bubbling and golden brown. Serve immediately. Ovenproof dish or 6-8 ramekins, frying pan, mixing bowl, wooden spoon, teaspoon, tablespoon, scraper, saucepan, fish slice, chopping board and a knife.